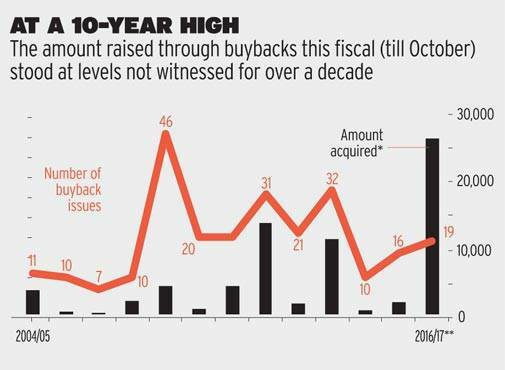 In the past seven months, the number of buyback issues has risen to a three-year high, driven by PSUs. Corporate India has been on a shopping spree of a different kind - share buybacks. Between April and October, 19 buyback offers were made - the highest in the last two fiscal years - according to Prime Database. Things looked more impressive in terms of the amount raised through buybacks - a massive Rs 26,353 crore, the highest in over a decade. 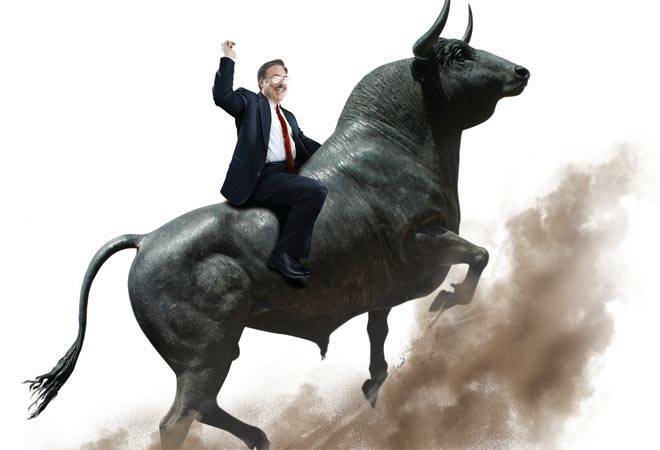 The capital markets have witnessed a bull run, touching highs in September, but with frequent volatility spoiling the mood of investors. It gained almost 11 per cent between April and October. The buyback of shares has only propped up the markets further. But what prompted an increase in the number of buybacks, which is a likely phenomenon of a bear market? Says Pranav Haldea, Managing Director, Prime Database: "The trigger was the government's disinvestment programme to meet targets." Nearly 65 per cent of the amount acquired through buy backs was contributed by public sector units (PSUs), including Coal India, NMDC, and MOIL. Since majority of them are cash-rich PSUs, leveraging cash through buybacks improves shareholders returns. Coal India acquired Rs 3,650 crore, NMDC got Rs 7,527.7 crore and National Aluminium amassed Rs 2,834.9 crore through buybacks. However, a few multinational companies were also in the buyback race. Novartis India bought back 38,20,000 shares and Bosch acquired 8,78,160 shares. In a buyback process, companies purchase their own shares from shareholders at a pre-decided price that leads to reduction in capital base and higher earnings per share. To some extent, increase in buyback activity was also a result of new tax norms announced in the Union Budget 2016/17, which proposed an additional 10 per cent tax on individuals earning dividends of over Rs 10 lakh in a financial year. This was in addition to the 20 per cent tax on dividend distribution. In absence of healthy dividend payouts by corporate India, which grew only by 2 per cent in 2015/16, buybacks worked as an alternative way of rewarding shareholders. Most companies going for buybacks had high promoter stakes - 60-75 per cent. Financially speaking, more than 50 per cent of these companies were cash-rich. For example, Coal India and NMDC had cash and bank balance of Rs 38,312.8 crore and Rs 14,809.1 crore, respectively, in 2015/16. "Buyback activity is primarily a function of balance sheet strength of a company (cash balance) and market movements," says G. Chokkalingam, Founder, Equinomics Research and Advisory. Almost all buyback offers this fiscal are being done through the tender route - a process where a company offers to buy certain number of shares at a specific price directly from shareholders, and both majority and minority shareholders are treated equally. It was also a favoured route last year with 11 offers through tenders and five offers through stock exchanges. However, between 2012 and 2014, the open market route was popular, wherein companies had decided to acquire a certain number of shares at a fixed price cap. For instance,in 2011/12, about 97 per cent of buybacks were routed through open market compared to 86 per cent in 2012/13, and 78 per cent in 2014/15. This has also been the most successful year (till October) in terms of the amount acquired through buybacks compared to the past five years. According to Prime Database, the ratio of the offer amount to the acquired amount of the buybacks in the current fiscal stood at 99.9 per cent - the amount offered was Rs 26,321.4 crore and the amount acquired stood at Rs 26,291.1 crore. Last fiscal, it was Rs 18.3 crore and Rs 17.8 crore, respectively - a ratio of 96.9 per cent. This ratio had been lower at 72 per cent in 2014/15. "It is a simple function of demand and supply," says Haldea. Of late, more than 24 companies have announced their buyback plans and the investors would hope that the momentum continues. Some of the live buybacks offers in November include that of Eclerx Services, a knowledge process outsourcing company, and Aarti Industries.